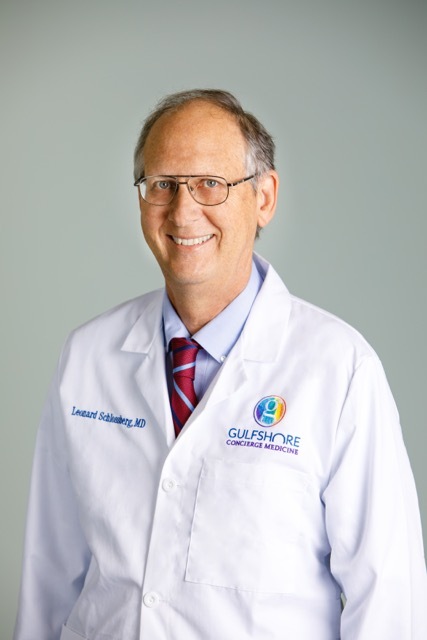 Dr. Schlossberg received his undergraduate degree from Columbia University and medical degree from New York University. After completing his residency and fellowship training at the University of Minnesota,he was hired as Assistant Professor of Medicine, serving as the Lead Physician of the Internal Medicine teaching clinic and on the Quality Assurance Committee. Dr. Schlossberg was also distinguished as the Chairman of the hospital Ethics Committee. In 1998, he was actively recruited to join the Cleveland Clinic in Naples, and served as one of the inaugural physicians and chosen to lead the Cleveland Clinic Executive Health Program. In 2006, Dr. Schlossberg formed his own concierge medical practice with partner Dr. Laura Lenholt, MD and together they developed a well respected, premiere concierge medical practice in town. 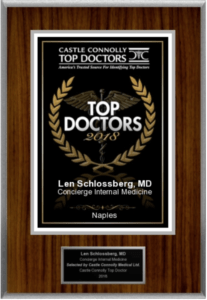 Since 2004, Dr Schlossberg has been named one of Southwest Florida’s “Top Doctors” by Castle-Connolly, a physician-led team of researchers who identify highly skilled exceptional doctors both regionally and nationally. Personally, Dr Schlossberg is happily married to his wife, Elon, and they are the parents of two children; Adrienne and Elliot.